The reading room is available to you online 24/7! In our reading room there is online access to the Christian Science website for further study or research. Christian Science Reading Rooms are bookstores and reading centers for the exploration of spirituality, prayer and healing. They are public resources for anyone on his or her quest for spiritual understanding and are open to people of all faiths, backgrounds, and ways of life. Reading Rooms are dedicated to helping visitors discover the peace, comfort, and spiritual solutions available to all from God. 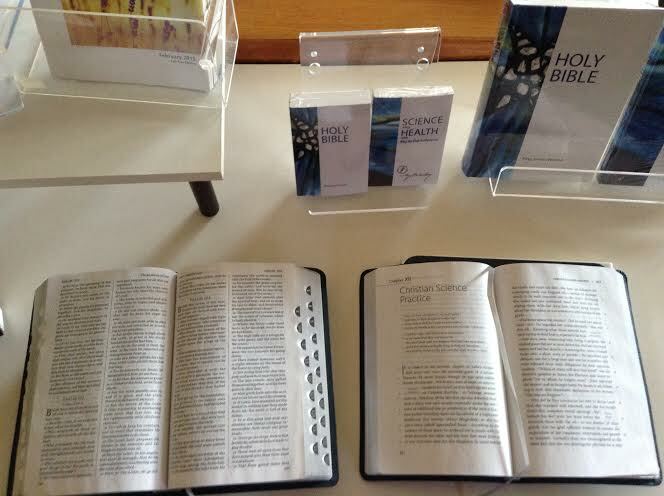 What is inside a Christian Science Reading Room? The Holy Bible-a source of inspiration for millions and Bible Reference books such as concordances, commentaries, and Bible dictionaries. Science and Health with Key to the Scriptures by Mary Baker Eddy- This companion to the Bible was written by a woman who searched the Bible for answers about how Jesus was able to heal the sick, feed thousands, and raise the dead. Her spiritual revelation led to a life of amazing healing work and the publication of this book.In its 600 pages it contains 100 pages of letters from readers freed from illness and sin by reading Science and Health. The Christian Science Monitor- For more than a century, this newspaper has been reporting the world’s events and trends in accord with its mission statement;”To injure no man, but to bless all mankind.” The recipient of seven Pulitzer Prizes, the Monitor is respected by many as a thoughtful, unbiased news source.